Beautifully engraved specimen certificate from the Gymboree printed in 2000. This historic document was printed by the Security-Columbian Banknote Company and has an ornate border around it with a vignette of the company's name. This item has the printed signatures of the Company’s Chairman and Chief Executive Officer, and Corporate Secretary, and is over 11 years old. Joan Barnes created the Gymboree Play and Music Program in 1976 when she couldn't find a safe place for new parents and children to play and exercise together. The Play centers' main purpose is to help children stimulate their development through music, exercise, art, and other activities as well as helping parents know how to participate in furthering their children's mental and physical growth. Gymboree classes include a multi-colored clown named Gymbo. The children interact with Gymbo following his "demonstrations" of activities and usually ending with "good-bye kisses". Other class activities include time playing with parachutes, playing with bubbles, and climbing on cushioned equipment. Classes are run for Infants up to age 6. Music played at Gymborees is often by the children's band Parachute Express. There are located across the United States, Puerto Rico, Mexico, and Canada. It has expanded its franchises in 30 countries including Bogota, Colombia; San Paulo, Brazil; Hangzhou, China; Hyderabad, India. Gymboree franchises nearly 300 Gymboree Play & Music centers around the globe. In recent years, Gymboree is competing with The Little Gym, Romp 'n' Roll, and My Gym. In 1986, the company opened a chain of clothing stores named Gymboree. Gymboree stores offer coordinating children's clothing. The sizes range from birth to age twelve. 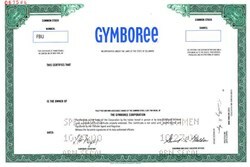 Gymboree, in its current incarnation (it has reorganized several times) is incorporated under the Gym-Mark, Inc nameplate. It currently operates 580 Gymboree Retail, 80 Gymboree Outlet, 100 Janie & Jack, and 20 Crazy 8 stores in the United States. Gymboree operated a chain of 17 women's clothing stores called Janeville until all locations closed by January 2007. Crazy 8 was started in August, 2007. It features lower-cost articles of apparel and is Gymboree's direct competitor for The Children's Place and Old Navy. The music and play centers sell products related to their activities, such as toys, musical instruments, and compact discs.